By using CoPP, we can make a part of control plane traffic prioritised so that it can be efficiently processed by control plane in timely manner. Some other less important control traffic will be dropped on the entrance to control plane or slowed down by using buffering. 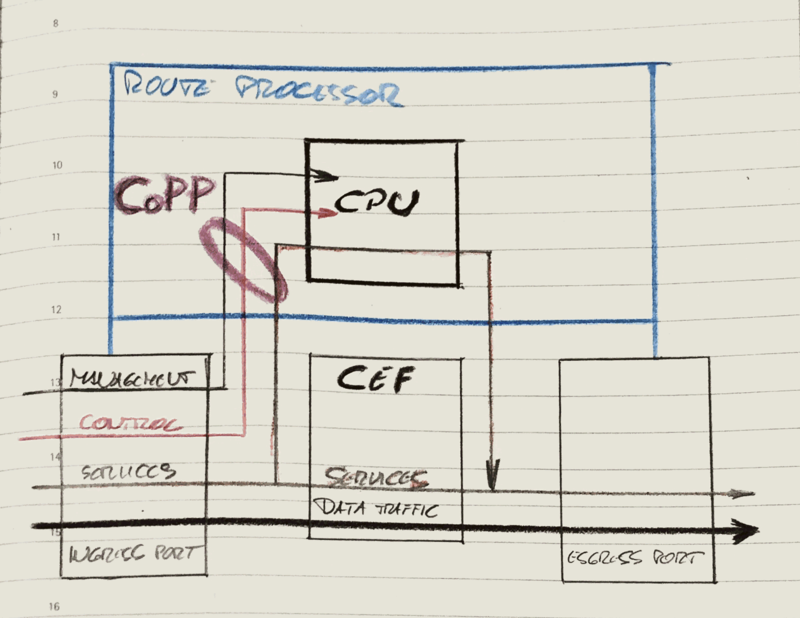 We can use QoS techniques in the entrance to Router Processor (showed in the image above), enabling us to drop or even better, to throttle some less important control traffic flows. In this way whole valid control plane traffic gets through but some flows slower that others. This interface is receiving all control plane traffic that is destined for one of the router interfaces. This is usually management traffic and routing protocols traffic. Most control plane protection features operate on this sub-interface, so this sub-interface provides most features, such as policing, port filtering, and per-protocol queue thresholds. Class-map type port-filter allows for automatically dropping of packets destined for the TCP/UDP ports not currently open in the router. The operating system automatically detects all open ports, and you can manually configure some exceptions. This can significantly reduce load on device CPU during flooding attacks. If traffic destined to Route Processor is not TCP/UDP, that kind of control traffic ends up on the CEF exception sub-interface. Per-protocol queue thresholds set selective queue limits for packets of different protocols, such as ICMP, BGP, OSPF, etc. We have in our example below policy-map ICMP_RATE_LIMIT which will catch all ICMP packets and do some rate policing on them. This sub-interface is handles transit IP traffic that is not able to be handled by faster hardware CEF mechanism. This usually happens when a packet must be routed out of Ethernet interface and there is no ARP mapping done already for that MAC. In this case we will be switching in the processor by making ARP lookup to find the next-hop MAC address. Like the name says, packet that causes an exception in CEF switching ends up here. Example of this kind of traffic is non-IP traffic destined to router itself, CDP, OSPF updates, and ARP packets. There are two ways of doing this. We can apply separate rate-limiting policy to any of the sub-interfaces or apply one aggregate policy for all sub-interfaces which is knows as classic control plane policing. Using both the sub-interface and aggregate policy is possible but can be unstable on some IOS versions thus is not recommended. In our configuration example below we will configure separate rate-limiting policy to each of the sub-interfaces. Before packets reach one of specific control plane sub-interfaces, they are processed with more different ingress features. Packets are going through input access-list, uRP checks and aggregate control-plane policy if one is configured. After this, packets are forwarded to sub-interface-specific policy, the packets are then queued onto the respective interface input queue and handled via selective packet discard policy. Here’s the example of Control Plane Protection. I’ll just put the example here and the explanation, bullet by bullet at the bottom. The class-map type port-filter is really cool. It allows to match some of the ports (like 2323 and 2424 in our example). The best part is that you are able to match all closed ports on the router dynamically and drop packets destined to non-listening ports before the router process them and responds with ICMP unreachable or TCP RST packet. In the first part of the example above, we are blocking all closed ports except TCP 2323 and 2424. In the next part we matching ICMP traffic and limiting that traffic going toward the host sub-interface, which means to the Route Processor. Next example is checking transit fragmented traffic matched with an access-list. Fragmented transit traffic will be limited to 1000000 packet per second rate on the transit sub-interface with some burst. At the end of the example all other packets resulting in CEF exceptions are limited to 400 packets per second. In the last few lines we are applying service policies to all three sub-interfaces. With this step we are actually applying the Control Plane Protection.